Eight years ago I joined Canonical to work on bringing the power of Open Source to everyone . What really caught my attention was the calibre of the people and the ambition of the vision. A lot has changed since then, but those two have remained constant. Canonical has been lucky to attract bright, interesting and focused people. I use bright intentionally - many are smart, some are brilliant, but all are bright - with an open minded approach to continuous improvement (from products to ways of working). Everyone is deeply committed and focused on making things happen. It's the most productive environment that I've enjoyed. I've spent lots of energy on the people and culture aspects of the company over the years. But, I struggle for a single outstanding lesson. It's all those simple points that sound so blithe in management books - like "hiring great people is hard". If there's a meta-lesson it is that ideas and execution both count. And, execution ultimately comes down to people. If everyone understands what we're doing, and why we're doing it, then they'll help with how to do it. I told you it would sound blithe! "You pass this way but once..."  is a short-hand saying I often use, it speaks to me because we won't get the time again. In a professional context it translates to doing something meaningful. What is meaningful is a personal consideration. I start with the belief that technology can and should improve our lives. And that Open Source is significant for both social and technology reasons. It follows that making open source something everyone can use is an important goal. To empower everyone the great capabilities in open source have to be available and accessible. That ambitious vision is what particularly attracted me to Canonical. In 2006 FOSS was already the basis of the Internet and an expanding set of Web connected companies. But, it was still the preserve of a small set of technologists. Ubuntu's focus has always been on improving the core experiences, making sensible choices for users and enabling a wider set of users access to the power of free software. 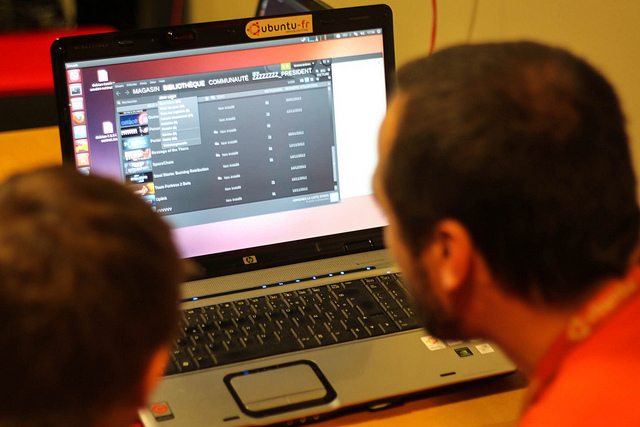 To this day there's nothing better than seeing someone using Ubuntu. Even this week I got a great kick out of seeing a coffee shop start-up developer booting Ubuntu on his laptop and spinning up Ubuntu instances in the Amazon cloud. Realising that the tools you help to provide people gives them wider horizons is fantastic. FOSS is fantastic for developers and end-users, but Open Source is not a business model . FOSS community advocates and users play an important role in building and promoting open source with both consumers and enterprises. But, buying decisions still reside with procurement departments and budget holders who are driven by traditional incentives. In the pure form OSS is post scarcity , Corporations are not. Buyers may understand the tragedy of the commons, but their concerns are more short-term and immediate. Over time, this understanding of the pressures and concerns for customers has made me much more of a pragmatist about the link between OSS and business. I'm ultimately focused on the sustainability of FOSS. Quite simply the small number of successful open source companies is a risk  to all that rely on it. Consequently, I'm by no means commited to the fact that everything should be open source. The good news is that as open source and SaaS based business has become more common the variety of opportunities has increased. Aside from the unique pressures of being open source focused, Canonical is also a high-growth company. All high-growth organisations face their challenges and tribulations. The technology industry generally rewards those that move fast and find new space ahead of the rest. This puts intense pressure on the need to grow and develop. It can be hard to balance those ambitions and opportunities against capacity in the team. It's tough for everyone to keep running every marathon at sprint speed. We've also had our fair number of failures, be that at a personal, project or organisational level. I don't like failure, I don't enjoy it. But, without it you can't do anything that stretches the boundaries. And every so often you have to accept that it's a fine line between stretching the boundaries, and snapping the elastic! But, above all else you can only be buoyed by the fantastic people around you. Eight years of amazing people, doing fantastic things - with a few dings, perhaps a bit wiser, and definitely older - it's been brilliant. LinkedIn faithfully alerts me as the sound of each anniversary whooshes past me. Since I wrote this we've seen a number of security problems with core Internet infrastructure which is Open Source so most people just assume that somehow it writes itself.